The new Acer Chromebook 13 and Chromebook Spin 13 are ideal for business customers. The Chromebook 13 starts at $649.99 and the Chromebook Spin 13, shown here in display mode, starts at $749.99. Acer’s Chromebook Spin 13 and Acer Chromebook 13 are ideal for business customers, featuring stylish and durable all-aluminum designs and 13.5-inch displays. They will be available through the channel in North America starting in September, priced starting at $649.99. 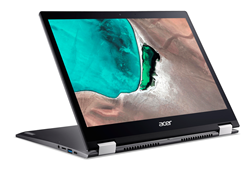 Acer America today announced that its two new premium Chromebooks – the Acer Chromebook Spin 13 and Acer Chromebook 13 – will both be available through the channel to commercial customers in North America starting in September. The Chromebook Spin 13 is priced starting at $749.99 and the Chromebook 13’s pricing starts at $649.99. The Chromebook Spin 13 (CP713-1WN) is a convertible model with hinges that allow it to be opened a full 360-degrees, so the touchscreen display can be used in four versatile modes. It includes a Wacom EMR stylus for note-taking, sketching and interacting with the display. After use, the stylus can be kept safely in the Chromebook Spin 13’s storage slot. Both the new Acer Chromebook Spin 13 and Acer Chromebook 13 feature an IPS 13.5-inch Full HD+ display with 2256x1504 resolution for enjoying apps, documents and video in 3.3 million vibrant pixels. The display’s 3:2 aspect ratio adds 18 percent more vertical space compared to an equally wide 16:9 display, so customers will view more on their display. 1) Battery life is based on Google power_LoadTest for non-touch model (http://www.chromium.org/chromium-os/testing/power-testing). Actual battery life varies by model, configuration, applications, power management settings, operating conditions, and utilized features.